Our first group motorcycle ride was from Mt. Rainier, MD where Alvin and Yvonne live and it took us about 5 miles ride to Washington DC Convention Center. We met around 9:30am first at the Mt. Rainier house and left about 11:15am. The ride was easy because no one in the group had any major difficulty in riding. We stayed together and separated whenever the traffic red lights came on and we had to stop frequently via New York Ave in DC. We parked in good spot by the church on the 8th Street and luckily, the parking was free. We met a few deaf bikers at the tradeshow and some joined in this group for this photo. From top left to right: Ed Martin (VA) , Ray Porras (MD), Jim Hynes (MD), Sandy Swafford "SAZZ" (VA), Deb Perkins (MD), Couple: Alvin Reeder and Yvonne Mattiello (PA/MD), Tom Buckingham (PA/MD). From bottom left to right: Bill Witkowski (CT), Tim Mulford (MD), Deb Slavy (MD), Jon Sadowski (NY/MD). 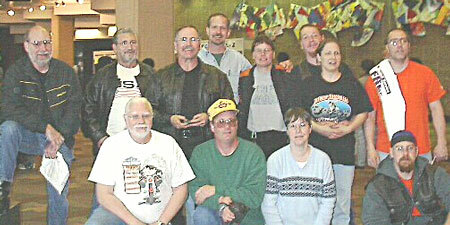 This group photo was taken in Washington DC Convention Center at the Deaf Fiesta trade show. More than 3000 people attended the show and we had about 75 booths and exhibits. Afterwards, some of us went to Capitol Brewery restaurant for our dinner and great beer. After dinner, some of us went to Alvin and Yvonne's place to watch University of MD basketball game in our College Bowl tourney. Eventually, U of MD won the game and the national college basketball champion a few days later.